The Tooth Fairy Lives in FairyLand, of Course. Here is the letter Cody left for the Tooth Fairy on the night of her first visit a little over a week ago. I wrote while he dictated. I was proud that he remembered his manners in the writing of the letter. I was also very pleased that he asked for a container to keep his teeth in. He obviously was not happy with the small knock off Tupperware container I had given him at one in the morning when he woke me to tell me his tooth had fallen out. I had not planted any seeds for this request but this was exactly what he was going to get. Several days earlier I had found and purchased a small silver dish with lid that I thought would be a perfectly magical place for him to store his baby teeth; he is planning on keeping them. I polished it until it shone. Husband had already gone to the Post Office and acquired a supply of golden one dollar coins for the present part of great occasion. We were ready. Or were we? Read that letter again. He wanted to visit FairyLand. That was easy enough to brush off, only fairies are allowed to visit there. Everybody knows that, but he wanted a picture of it. Hum. How is that going to work? After giving it a little thought I knew exactly what to do. 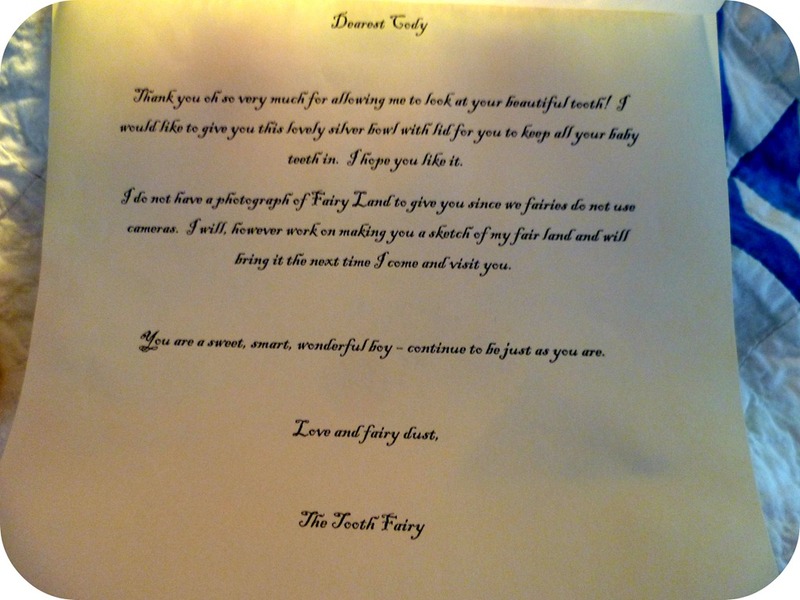 Here is the letter the Tooth Fairy left for Cody. Sorry the photo is not very good, but I think you can read it. Notice how I solved the problem of the photograph. I mean, have you ever seen a fairy use a camera? Fairies sketch, simple as that. Well, not this fairy, but I know someone who is just magical enough herself to be able to accurately sketch FairyLand. We will get to that in a minute. Here is the front of the letter, the silver dish, and the golden coin. Please note the fairy dust along the top of the letter. Yes I know it looks like a fourth grader made it, I am not artistic. I was happy with it and it turns out Cody was too. The following morning Cody came running into our bedroom waving the letter around chanting that the Tooth Fairy had come. After I read the letter to him he ran back to his room and brought out the dish. He was very happy about the gold coin and indifferent about the dish. Not much can compete with a golden coin when you are six. At first he thought that the Tooth Fairy had forgotten to bring a photo of FairyLand but after I read the letter again and explained that she needed time to draw him a sketch he was satisfied. He has been asking about that sketch ever since. Here is the sketch. It is a magical mixture of watercolor, color pencil, and ink measuring eight by nine inches. 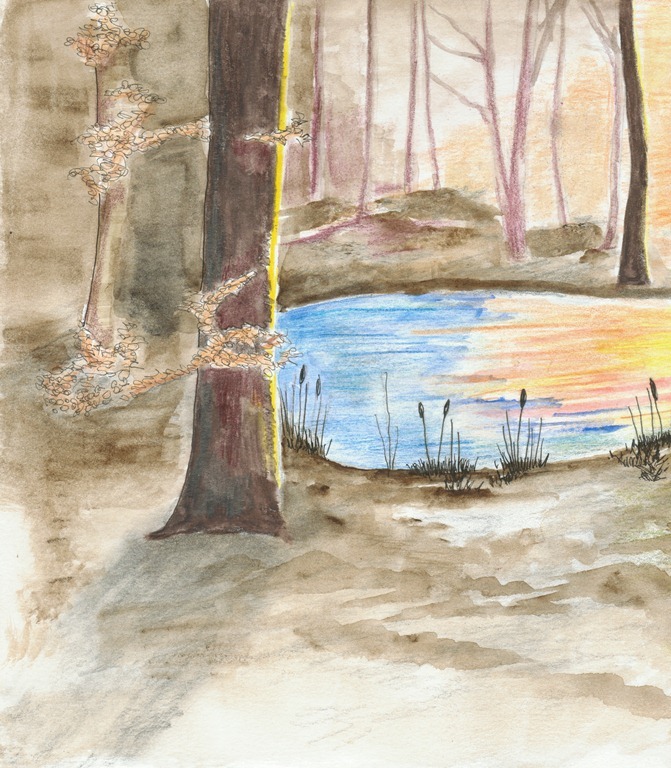 This is a scanned copy, the original has dainty bits of shimmering glitter, green and gold, hidden behind and between the distant trees and a small pool of the shimmer in the blue waters of the pond. The artist behind this piece of childhood memory for Cody is a very long time friend of mine, Christine Kennedy. I have known her since our kindergarten days, grew up with her in the same small town, and while we have never lived in the same town since we graduated, we have never lost each other. She is one of those friends that always has your back and knows you sometimes more than you know yourself. We are very lucky that her and her sweet husband live a mere hour from us and that both of them are such a part of our boys’ lives. When Cody requested a picture of FairyLand, I knew exactly who could make that happen for him. Not only did I know I would get something beautiful but I was excited to be able to include her in this brief and wondrous period of Cody’s childhood – the time where there is magic under every rock, fairies are real, and when you ask for a picture of FairyLand you fully expect you will get one. I highly suggest you check out her site. While she has been an artist her entire life, she has just recently taken that great leap to start her own company and follow her passion. If you need a freelance illustrator, some help with a storyboard or project or perhaps just a simple but brilliant sketch of FairyLand for your child, contact Christine. Cody’s second tooth fell out six days after his first one. The Tooth Fairy found him and delivered another gold coin and the sketch even though we were spending the night at Grandma’s house. After the excitement wore off over another gold coin, we examined the drawing. I pointed out the glitter and explained that for a brief period after a fairy flies away, a small cloud of fairy dust remains behind. We tilted the sketch under Grandpa’s old reading light, watching the fairy dust on the page shimmer. He was in awe when I told him it was a one of a kind sketch made just for him. It was magical to watch Cody share his excitement with his brother, their two blond heads almost touching, noses inches away from a sketch drawn by the Tooth Fairy herself. This entry was posted in Little Feet and tagged Art, Children, Design, FairyLand, Family, Inspiration, Life, Love, Magical, Parenting, The Tooth Fairy, Watercolor. Bookmark the permalink. 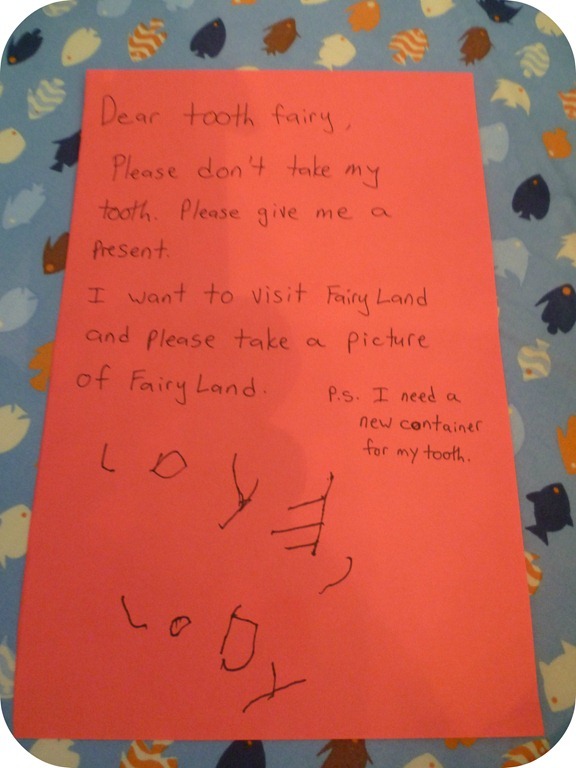 30 Responses to The Tooth Fairy Lives in FairyLand, of Course. I do so enjoy the little magical moments of my boys’ childhoods. It does look like a lovely place to call home, doesn’t it? I’d knock out one of my teeth just to get that letter and sketch! What a blessed child…. LOL! Oh, please don’t go doing that! This justifies what I said before – you are an amazing Mommy! Well, thank you! I think I am having as much fun helping the Tooth Fairy out as Cody is getting little magical things from her. What a beautiful story! It is indeed a special time when fairies still exist. Thanks! I fear this special fairy dust covered magical time will be fleeting so I am trying to make it as special as possible. Wow that is indeed a beautiful story. I’m sure I never put that much thought into what my kids got, it makes me feel kind of sad for them. Oh, don’t feel sad for your kids, I am sure you made some great memories with them too. Also I am much better at this Tooth Fairy thing than I am with Santa and the whole crazy busy Christmas time. November and December are just too much and I get so stressed out with all there is to do. The Tooth Fairy is simple, there are no expectations or rules to follow and a little bit goes a long ways. You’re welcome, you and your friend. 🙂 And thank you for your kind compliment! Great post. This is inspiration for me if ever I become a parent. Really nice drawing too, your friend is very talented. Those were the days and I am noticing that those days are flying by faster and faster as my kids grow. You really should have fun with the magical part of childhood, whether you are the child or the adult. I was very taken with the drawing and the fact that my very good friend drew it just makes it that much more special. Thanks for dropping by and leaving a comment. This time is whizzing by. I love your approach with Cody. Fairies and Santa and unicorns are fleeting and magical. We get to keep them in our lives by making them for our kids. You are right. We get to have that magic twice if we are lucky, once as kids and once as parents. I really like the whole Tooth Fairy thing better than Santa. It is much less commercial and there is lots of room for interpretation. Maybe your Tooth Fairy rides a unicorn; I think ours rides on pale green glittered walking sticks. This is precious! It actually brought tears to my eyes! You are an amazing mom and this makes me so excited for when my son has his first encounter with the tooth fairy!! Thanks for sharing! Ah, thank you for the compliment. It is all about how you tell the story. I told of the magic of the Tooth Fairy and Cody ran with it, creating FairyLand in his mind. It was so cool to be able to get a sketch made just for him. Carter is watching all of this and wiggling his firmly rooted baby teeth just waiting for the day the Tooth Fairy visits him. 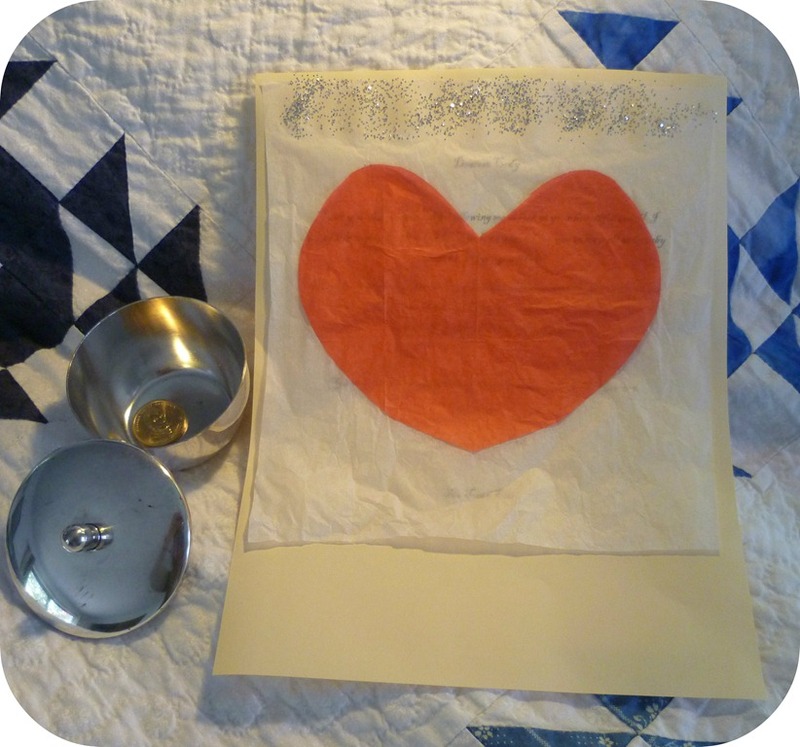 I bet you will make your son’s first encounter with the Tooth Fairy a wonderful one. Cody is so lucky to have a mom who makes sure that magic exist. You inspired all of us to do the same. My son lost his first tooth and he did get a dollar from tooth fairy. After this post, I will make sure it would be as magical from the gold coins to the fairy dust. This is the time where our kids believe that magic and dreams and it’s up for us to make it last for as long as we can. Thanks. Thank you! I think it is such a fun time for both the kids and the parents. Afterall, who doesn’t need just a little bit of magic in their lives?